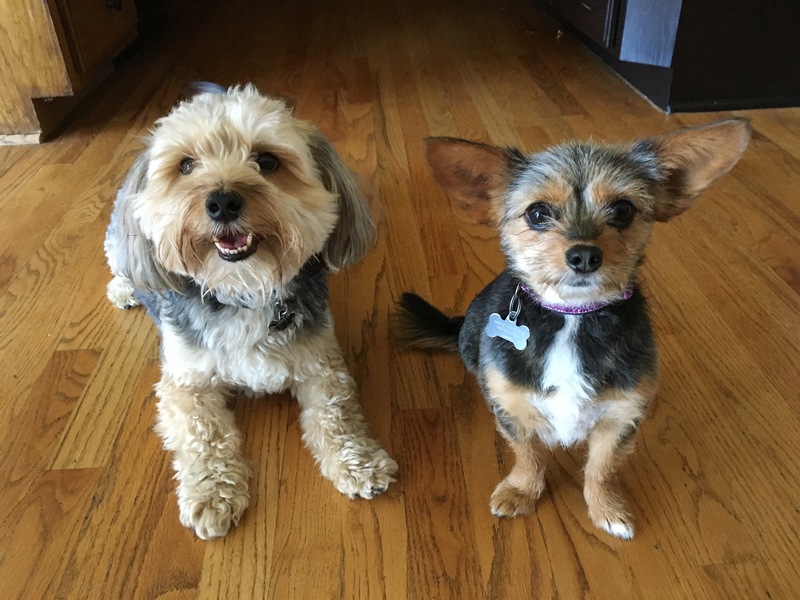 Baylee (left) is a four-year-old Morkie who gets over excited when anyone comes in, knocks on the door or when the garage door opens. His room mate Bella jumps up and likes to lick people to like crazy. I had barely sat down with the dog’s guardian before I saw them engage in a few actions and behaviors that gave me a good clue as to reason for their issues. I suggested that the guardian start disagreeing with the dogs before they actually jump up onto any human’s laps. Its always more effective to disagree with a dog before it engages in an unwanted action or behavior. Before anyone gets the wrong idea, there’s nothing wrong with a dog being on your lap, but in this case it will be very beneficial for the humans to only allow it when they give the dog an invitation each time. Currently the dogs feel that human laps are their right and as a result, don’t have any boundary when it comes to people’s personal space. We spent the next few minutes chatting about the dog’s day-to-day routine. Because the dogs didn’t have very many rules to follow, it’s a good bet that they are under the impression that they are equals to their humans in terms of authority. If the dog considers it on the same level as a human, then it should have the same rights and privileges, right? In order to change these dog’s behaviors I knew I needed to change the leader follower dynamic in the home first. One of the easiest ways to do this is to practice something that I like to call Petting with a purpose. It will take the humans a couple of days of consistent awareness and immediate halting of prolonging attention when the dogs jump up on their own. But once this becomes a habit, they will unconsciously be keeping the leader follower dynamic needed to stop the dogs from acting out. Next I suggested a couple of rules and boundaries for the guardians to incorporate into the dog’s lives. By adding some structure into the dogs day-to-day routine and every day events, we can help them gradually develop a followers mindset. One of the suggestions I made was to ask the dogs to sit before letting them in or out of a door. Making these small changes to how the humans interact with the dogs will go a long ways, but if everyone in the family adopt them. Consistency is HUGE. Because the dogs did not always listen on the guardian’s first command or correction, I went through a series of escalating consequences that I like to use to disagree with a dog when it does something I don’t like. Now that we had a foundation in place, we were ready to start tackling some of the dog’s other unwanted behaviors. The guardian mentioned that Baylee got so excited at the prospect of a walk that he was borderline out of control during the leashing process. She said she had been working with him at it and he had gotten better but he was still very excited as soon as she picked up the leash. Whenever a dog is in an excited state of mind, and we pet it or continue to move forward, we are nurturing that unbalanced behavior. Over time this makes a small issue, pretty intense. I spent the next few minutes showing the dog’s guardian how to communicate to Baylee that she was not going to continue if the dog got overexcited. After about 15 minutes, we tried it again and this time Baylee was able to keep his composure throughout the entire process. It will be important for the guardians to take their time and follow the same technique any time that Baylee starts to get over excited at the prospect of a walk or any other activity. If they are consistent in this approach, it shouldn’t take longer than a few repetitions before Baylee understands that he needs to remain calm throughout the process in order to go forward or continue. Before we got started on the walk itself, I spent a few minutes discussing the rules that I use when taking my dogs out for what I call a Structured walk. Many people do what I call guilt-walking. Because they feel that the dog has been pent-up in the house or not gotten the exercise they think it needs, they decide to let it behave however it wants when on a walk. But dogs don’t hold grudges that way and you’re not going to earn your way into the dogs heart by doing so. As a matter of fact, letting the dog get overexcited and do anything they want on a walk will generally make matters worse. After going over the rules, we headed out on a walk and it was quickly apparent to the dog’s guardian that adding structure and taking our time during the leashing process paid off big time. When we returned from the walk, I tackled Baylee’s bad habit of barking anytime someone knocked on the door or comes inside. Within a couple of minutes Baylee was no longer barking at all as the family’s eldest son came into the house. By the end of the session, both dogs were noticeably calmer, were listening to their guardian’s commands and corrections right away and had stopped jumping up or nudging them for attention. If everyone in the family practices the various techniques and exercises that we introduced during the session, they will be able to quickly put a stop to the dogs unwanted behaviors for good.